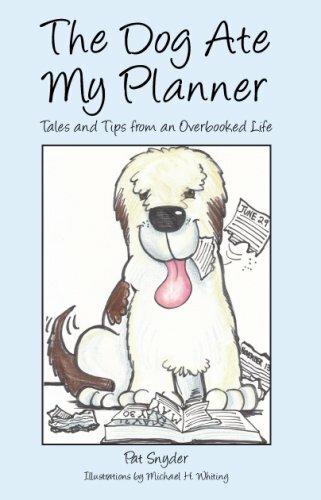 For additional information about this book, visit the website www.TheDogAteMyPlanner.com. Doggone it! No matter how carefully you organize and plan, some dog comes along and eats your day. Could be the computer freezes, or mom misplaces her purse over at the assisted living center, or a brand new granddog is experiencing separation anxiety. In The Dog Ate My Planner, Pat Snyder offers the sandwich generation a whole new approach to getting organized: lots of fun stories about life gone wrong, plus 74 fun tips for setting it right. For nearly a decade, Pat Snyder, a lawyer and mother of three, has chronicled her crazed struggle to lead a balanced life in “Balancing Act,” a regular humor column that appears in Suburban News Publications, a chain of twenty-two weekly papers in the Columbus, Ohio area. When she is not dancing around in a Dr. Seuss hat and leading laugh-ins as a certified laughter leader with the World Laughter Tour (www.worldlaughtertour.org), Pat, an award-winning writer, speaks on life balance and leads workshops to help others bring more humor into their lives and their writing. Before law school, she worked as a reporter for the Akron Beacon Journal. When her marriage to Bob Snyder made him both an unsuspecting stepparent and first-time parent, the two of them co-authored a Sunday column for The (Cleveland) Plain Dealer on the challenges of stepfamily living. Her account of their adventures combining his Hanukkah traditions with her Christmas ones was published in the book Cup of Comfort for Christmas. Pat lives in Columbus, Ohio, with all the dogs that eat her planner. Her online home is www.PatSnyderOnline.com.